Join Chef Rita to learn the secrets of Frikadellen, sometimes called "the German hamburger." 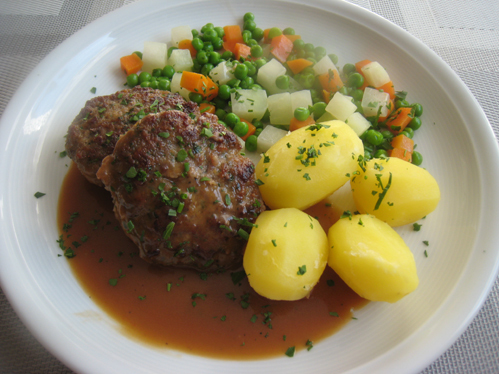 Frikadellen (also known as Buletten or Fleischpflanzerl) are made of minced veal, pork, or beef (or a blend of two meats) and resemble a flattened meatball. Many variations of Frikadellen are popular throughout Europe, including Germany, Austria, Norway, Poland, Russia, Ukraine, the Netherlands, and Lithuania. Combined with onions, a binding agent and "secret seasonings," savory and succulent Frikadellen are often served with boiled potatoes and gravy. They are equally popular served on a Kaiser roll with lettuce, tomato, pickled cucumbers, finely sliced, deep-fried onions and curry ketchup. This informative and enjoyable class includes hands-on instruction, Chef Rita's delicious family recipe to take home, a drink from the bar, generous samplings, and of course, great camaraderie. Master the art of Frikadellen at the DANK Haus with this traditional German dish! Sometimes called "the German hamburger," savory and succulent Frikadellen are made of minced veal, pork, or beef (or a blend of two meats). Combined with onions, a binding agent and "secret seasonings," these giant meatballs are popular throughout Europe and are often served with boiled potatoes and gravy.